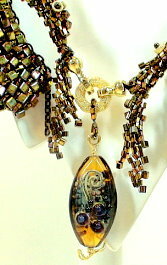 This entry was posted on April 29, 2009 at 7:26 pm	and is filed under bead weaving, beadwork. Tagged: bead stringing, bead weaving, beading, beading needles, beading thread, fireline, john james english beading needles, nymo thread, pony needles, sharps needles. You can follow any responses to this entry through the RSS 2.0 feed. You can leave a response, or trackback from your own site. I prefer James short tapestry point beading needles in sizes 10, 12, and 13. These are quite sturdy and less prone to pierce the thread. I had a packet of Mary Arden needles also so called made by Entaco Ltd. The quality was terrible snapped very quickly and looked very similar to Chinese needles which are shiner. Problem with this was it said they were made in England. I think someones lying.